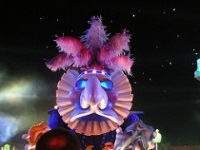 The main winter event on the French Riviera and one of the major carnivals in the world, the Nice Carnival brings the city to life with a series of flower parades, float processions, fireworks and concerts every year. The float procession is one of the main events and features 18 floats and entertainment provided by more than 1,000 musicians and dancers from around the world. Every year a festival theme is declared. Anything goes during Carnival, which is all about the joys of difference and friendship between different nations. The flower parades, often called flower wars, are a highlight of the festival. They are battles between competing floats bedecked in beautiful floral arrangements, many samples of which are thrown into the crowds. The carnival is meant to brighten up the winter months and it does so beautifully. Those travelling in France during winter therefore have an added incentive to visit the lovely city of Nice.